Go Metro to Dodger Stadium by connecting with the Stadium Express at two convenient locations – Union Station or the South Bay. And your Dodger ticket is good for the Dodger Stadium Express. Union Station is served by many Metro and municipal bus lines and Metro Rail's Red, Purple and Gold lines, as well as Metrolink and Amtrak. Harbor Gateway Transit Center, in the South Bay, is also served by several Metro bus lines, the Metro Silver Line and Torrance Transit. You can also board at any of the following stations in the South Bay – Slauson, Manchester, Harbor Freeway, or Rosecrans. So it’s easy to leave your car at home and connect with the Dodger Stadium Express. To plan the route that’s best for you, use the Trip Planner , or call 323.GO.METRO. We recommend arriving early to Union Station and the South Bay stations; crowds are heaviest near game time. On Metro Rail, most trips run until approximately midnight Sunday through Thursday nights, and until approximately 2am Friday and Saturday nights; last trips on bus lines vary. Be sure to check the schedule for your return trip head of time. Board near the taxi zone at Union Station West (adjacent to Alameda St). Buses run every 10 minutes, starting 90 minutes before game time through the end of the 2nd inning for all home games. 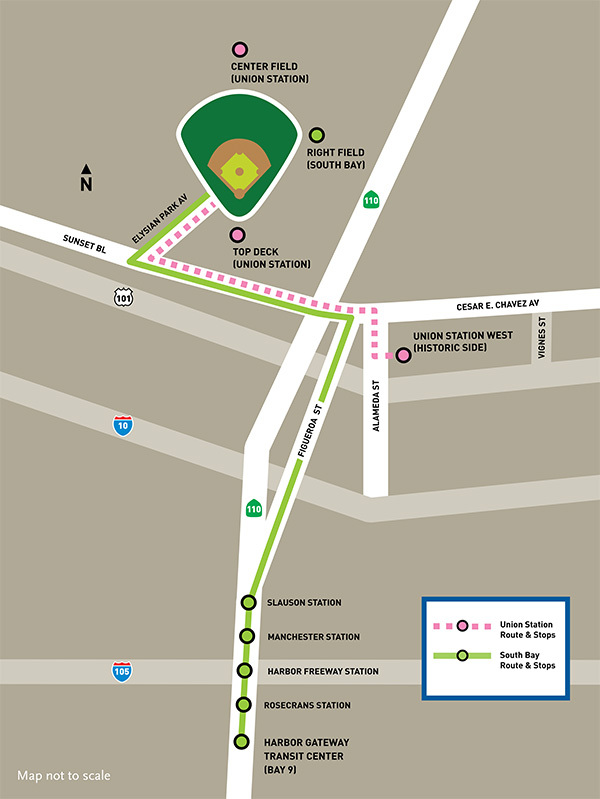 You can exit at one of two stops – behind Center Field or at the Top Deck. Service back to Union Station will pick up at the same stops after the game. Return service ends 45 minutes after the final out or 20 minutes after post-game events. Buses run every 20 minutes starting 2 hours before game time, with the last bus leaving Harbor Gateway Transit Center at game time. Return service begins after the end of the 7th inning, with the last bus departing 45 minutes after the final out or 20 minutes after a post-game event. Your Dodger ticket is good for the Dodger Stadium Express; regular fares apply on all other connecting bus and rail service. Arrive early; crowds are heaviest near game time. Go Metro to Union Station and connect with the Angels Express to Angels Stadium. Fans can ride the Angels Express to Angels home games from stations on the Orange County Line from Los Angeles to Oceanside. Adult roundtrip tickets cost $7, and can be purchased at Metrolink station ticket vending machines by selecting “Special Ticket Options”. Please arrive at least 15 minutes before the train departure time to purchase your Angels Express tickets. For schedules and more information, visit metrolinktrains.com/angelsexpress . By using Metro’s Dodger Stadium Express, you’re helping to bring cleaner air to our community by reducing traffic throughout the highly congested Los Angeles area. Fewer vehicles on the road mean fewer emissions polluting the air, and a better quality of life for all. During its 24-year history, the Mobile Source Air Pollution Reduction Review Committee (MSRC) has removed 11,500 tons of harmful pollutants from the air by funding projects designed to reduce air pollution from mobile sources such as cars, trucks and buses. They’ve distributed more than $353 million to local governments, transit agencies and private businesses throughout the South Coast basin to build alternative fuel stations, purchase clean-fuel vehicles and implement other innovative clean air projects. The Dodger Stadium Express is a demonstration project made possible by Clean Transportation Funding from the MSRC. Thanks for leaving your car at home and supporting air quality by taking public transportation to Dodger Stadium. You’re on a winning team! The Dodger Stadium Express from Union Station will be running during selected special events. Buses will start running 90 minutes prior to the event start time. Service will only be provided from Union Station. Service leaves Union Station approximately every 10 minutes. You can exit inside Dodger Stadium at one of two stops – behind Center Field and at the Top Deck . Service will pick up at the same stops after the show. Return service runs until 45 minutes after the concert ends. Union Station is the primary transit hub for the region and is served by the Metro Red/Purple Line subway, the Metro Gold Line, the Silver Line, numerous Metro Bus lines, Amtrak and Metrolink . Visit Metro maps and timetables for every rail and bus line. Use Trip Planner or Google Transit to find routes and connections. Parking is available at Union Station for $8.